“DEA” redirects here. For other uses, see DEA (disambiguation). Not to be confused with Food and Drug Administration. The Drug Enforcement Administration (DEA) (/di.iˈeɪ/) is a United States federal law enforcement agency under the United States Department of Justice, tasked with combating drug smuggling and distribution within the United States. The DEA is the lead agency for domestic enforcement of the Controlled Substances Act, sharing concurrent jurisdiction with the Federal Bureau of Investigation (FBI), Immigration and Customs Enforcement (ICE), U.S. Customs and Border Protection (CBP), and the Department of Homeland Security (DHS). It has sole responsibility for coordinating and pursuing US drug investigations both domestic and abroad. 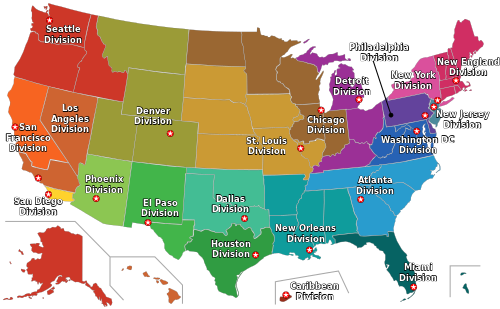 Map of the 21 DEA domestic field divisions: 1. Chicago, 2. Detroit, 3.Atlanta, 4. Dallas, 5. Denver, 6. Boston, 7. El Paso, 8. Houston, 9. Los Angeles, 10. Miami, 11. Newark, 12. New Orleans, 13. New York, 14. Philadelphia, 15. Phoenix, 16. San Diego, 17. San Francisco, 18. Seattle, 19. St. Louis, 20. Caribbean, 21. Washington, D.C. The Drug Enforcement Administration was established on July 1, 1973, by Reorganization Plan No. 2 of 1973, signed by President Richard Nixon on July 28. It proposed the creation of a single federal agency to enforce the federal drug laws as well as consolidate and coordinate the government’s drug control activities. Congress accepted the proposal, as they were concerned with the growing availability of drugs. As a result, the Bureau of Narcotics and Dangerous Drugs (BNDD), the Office of Drug Abuse Law Enforcement (ODALE); approximately 600 Special Agents of the Bureau of Customs, Customs Agency Service, and other federal offices merged to create the DEA. From the early 1970s, DEA headquarters was located at 1405 I (“Eye”) Street NW in downtown Washington, D.C. With the overall growth of the agency in the 1980s (owing to the increased emphasis on federal drug law enforcement efforts) and a concurrent growth in the headquarters staff, DEA began to search for a new headquarters location; locations in Arkansas, Mississippi, and various abandoned military bases around the United States were considered. However, then-Attorney General Edwin Meese determined that the headquarters had to be located in close proximity to the Attorney General’s office. Thus, in 1989, the headquarters relocated to 600–700 Army-Navy Drive in the Pentagon City area of Arlington, Virginia, near the Metro station with the same name. On April 19, 1995, Timothy McVeigh attacked the Alfred P. Murrah Federal Building in Oklahoma City because it housed regional offices for the FBI, Bureau of Alcohol, Tobacco, Firearms and Explosives (ATF), and DEA, all of which had carried out raids that he viewed as unjustified intrusions on the rights of the people; this attack caused the deaths of two DEA employees, one task force member, and two contractors in the Oklahoma City bombing. Subsequently, the DEA headquarters complex was classified as a Level IV installation under United States federal building security standards, meaning it was to be considered a high-risk law enforcement target for terrorists. Security measures include hydraulic steel roadplates to enforce standoff distance from the building, metal detectors, and guard stations. In February 2003, the DEA established a Digital Evidence Laboratory within its Office of Forensic Sciences. Two DEA agents in a shoot house exercise. The DEA is headed by an Administrator of Drug Enforcement appointed by the President of the United States and confirmed by the U.S. Senate. The Administrator reports to the Attorney General through the Deputy Attorney General. The Administrator is assisted by a Deputy Administrator, the Chief of Operations, the Chief Inspector, and three Assistant Administrators (for the Operations Support, Intelligence, and Human Resources Divisions). Other senior staff include the chief financial officer and the Chief Counsel. The Administrator and Deputy Administrator are the only presidentially-appointed personnel in the DEA; all other DEA officials are career government employees. DEA’s headquarters is located in Arlington, Virginia across from the Pentagon. It maintains its own DEA Academy located on the Marine Corps Base Quantico at Quantico, Virginia along with the FBI Academy. It maintains 21 domestic field divisions with 221 field offices and 92 foreign offices in 70 countries. With a budget exceeding $2 billion, DEA employs over 10,800 people, including over 4,600 Special Agents and 800 Intelligence Analysts. Becoming a Special Agent or Intelligence Analyst with the DEA is a competitive process. As of 2017 there were 4,650 special agents employed by the Drug Enforcement Administration. DEA agents’ starting salary is $49,746–$55,483. After four years working as an agent, the salary jumps to above $92,592. After receiving a conditional offer of employment, recruits must then complete a 18-week rigorous training which includes lessons in firearms proficiency (including basic marksmanship), weapons safety, tactical shooting, and deadly-force decision training. In order to graduate, students must maintain an academic average of 80 percent on academic examinations, pass the firearms-qualification test, successfully demonstrate leadership and sound decision-making in practical scenarios, and pass rigorous physical-task tests. Upon graduation, recruits earn the title of DEA Special Agent. The DEA excludes from consideration job applicants who have a history of any use of narcotics or illicit drugs. Investigation usually includes a polygraph test for special-agent, diversion-investigator, and intelligence research specialist positions. Applicants who are found, through investigation or personal admission, to have experimented with or used narcotics or dangerous drugs, except those medically prescribed, will not be considered for employment with the Drug Enforcement Administration (DEA). Exceptions to this policy may be made for applicants who admit to limited youthful and experimental use of marijuana. Such applicants may be considered for employment if there is no evidence of regular, confirmed usage and the full-field background investigation and results of the other steps in the process are otherwise favorable. The DEA’s relatively firm stance on this issue contrasts with that of the Federal Bureau of Investigation, which in 2005 considered relaxing its hiring policy relevant to individual drug-use history. The DEA Aviation Division or Office of Aviation Operations (OA) (formerly Aviation Section) is an airborne division based in Fort Worth Alliance Airport, Texas. The current OA fleet consists of 106 aircraft and 124 DEA pilots. The DEA shares a communications system with the Department of Defense for communication with state and regional enforcement independent of the Department of Justice and police information systems and is coordinated by an information command center called the El Paso Intelligence Center (EPIC) near El Paso, Texas. 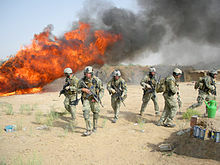 DEA agents burning hashish seized in Operation Albatross in Afghanistan, 2007. Rapid Response Teams (RRT), previously known as Foreign-Deployed Advisory and Support Teams (FAST), were decommissioned by DEA Acting Administrator Chuck Rosenburg on March 2017 via memorandum. DEA officially created and standardized its Special Response Team (SRT) program in 2016 to address higher risk tactical operations in the field. DEA mandates that each major domestic office maintains an operational Special Response Team. The SRT Certification Course (SCC) consists of 11 days of SRT Basic and five days of SRT Advanced at the U.S. Army base Fort A. P. Hill in Virginia. The SCC cadre are former operators from the DEA RRT’s best and most seasoned agents. The training responsibility for the SRT was transferred to the DEA Office of Training to a newly created training unit with former members of RRT. The SCC course trains SRT candidates in team movement, high-risk entry, tactical weapons proficiency, and principles of dynamic operations. Some of the SRT missions consist of high-risk arrests, vehicle assault, specialized surveillance, custody of high-profile individuals, dignitary and witness protection, tactical surveillance and interdiction, advanced breaching, tactical training to other police units, and urban and rural fugitive searches. 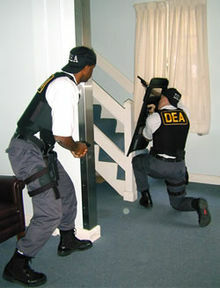 In the past, DEA had other tactical teams like the High-risk Entry Apprehension Teams (HEAT) in some Field Divisions, and Operation Snowcap Teams (predecessor of FAST). The teams administered by the Mobile Enforcement Section, the Mobile Enforcement Teams (MET), and Regional Enforcement Teams (RET), were mobile investigative units intended to deploy resources to state and local agencies (MET) or DEA Field Divisions (RET) in need of assistance with a particular investigation or trafficking group. These programs ended in the early 2000s. The DEA Special Operations Division (SOD) is a division within the DEA, which forwards information from wiretaps, intercepts and databases from various sources to federal agents and local law enforcement officials. The SOD came under scrutiny following the 2013 mass surveillance disclosures. The Domestic Cannabis Eradication/Suppression Program (DCE/SP) began funding eradication programs in Hawaii and California in 1979. The program rapidly expanded to include programs in 25 states by 1982. By 1985, all 50 States were participating in the DCE/SP. In 2015, the DCE/SP was responsible for the eradication of 3,932,201 cultivated outdoor cannabis plants and 325,019 indoor plants for a total of 4,257,220 marijuana plants. In addition, the DCE/SP accounted for 6,278 arrests and the seizure in excess of $29.7 million of cultivator assets. In 2014, the DEA spent $73,000 to eradicate marijuana plants in Utah, though they did not find a single marijuana plant. Federal documents obtained by journalist Drew Atkins detail the DEA’s continuing efforts to spend upwards of $14 million per year to completely eradicate marijuana within the United States despite the government funding allocation reports showing that the Marijuana Eradication Program often leads to the discovery of no marijuana plants. This prompted twelve members of Congress to push for the elimination of the program and use the money instead to fund domestic-violence prevention and deficit-reduction programs. In FY 2018 the DEA budget was $2086.6 million. $445 million was spent on international enforcement and $1,627 million was spent on Domestic Enforcement. Breaking foreign and domestic sources of supply ($1.0149 billion) via domestic cannabis eradication/suppression; domestic enforcement; research, engineering, and technical operations; the Foreign Cooperative Investigations Program; intelligence operations (financial intelligence, operational intelligence, strategic intelligence, and the El Paso Intelligence Center); and drug and chemical diversion control. Reduction of drug-related crime and violence ($181.8 million) funding state and local teams and mobile enforcement teams. Demand reduction ($3.3 million) via anti-legalization education, training for law enforcement personnel, youth programs, support for community-based coalitions, and sports drug awareness programs. DEA agents’ primary service weapons are the Glock 17 and Glock 19, Remington 870 12-gauge shotgun, and Rock River Arms LAR-15 semi-automatic carbine in 5.56×45mm NATO. Agents may also qualify to carry a firearm listed on an authorized carry list maintained and updated by the Firearms Training Unit (FTU), Quantico, VA.
Special Agents may qualify with their own personally-owned handguns, rifle, and shotgun, and certain handguns are allowed to be used with permission from the FTU. Agents are required to attend tactical and firearms proficiency training quarterly, and to qualify with their handguns twice per year. The DEA has one of the most challenging handgun qualification courses in all of federal law enforcement. Failure to achieve a passing qualification score is the reason for most Academy dismissals and special agents in the field may have their authority to carry a firearm revoked for failure to qualify. Basic Agent Trainees (BATs) who fail the initial pistol qualification course of fire are placed in a remedial program to receive additional training. In remedial training, BATs receive five extra two-hour range sessions, for a total of 10 more hours of live fire training on their issued sidearm, in order to further aid them in helping pass the pistol qualification. After passing their pistol qualification, Basic Agent Trainees move on to receive formal training on the DEA’s standard-issue long guns and will continue to frequently shoot their agency-issued sidearm that they have already qualified on. In all, BATs receive a total of 32 firearms training sessions, when combining classroom instruction, gear issue, and pistol, rifle, and shotgun live fire training at the DEA Academy. They will shoot the qualification courses for all three weapons systems during their initial training, but must pass their final qualification attempts only on their Glock pistols in order to become a Special Agent. Trained to use shoulder-fired weapons, the Rock River LAR-15, adopted in 2004, and the LWRC M6A2 is the standard carbine of DEA. The Colt 9mm SMG was previously issued, but no longer in service. Agents are required to complete a two-day (16-hour) proficiency course in order to carry a shoulder weapon on enforcement operations. They may carry a Rock River LAR-15 or LWRC carbine as authorized, personally-owned weapons, provided they meet the same training and proficiency standards. In 2005, the DEA seized a reported $1.4 billion in drug trade related assets and $477 million worth of drugs. According to the White House’s Office of Drug Control Policy, the total value of all of the drugs sold in the U.S. is as much as $64 billion a year, giving the DEA an efficiency rate of less than 1% at intercepting the flow of drugs into and within the U.S. Critics of the DEA (including recipient of the Nobel Memorial Prize in Economic Sciences, Milton Friedman, prior to his death a member of Law Enforcement Against Prohibition) point out that demand for illegal drugs is inelastic; the people who are buying drugs will continue to buy them with little regard to price, often turning to crime to support expensive drug habits when the drug prices rise. One recent study by the DEA showed that the price of cocaine and methamphetamine is the highest it has ever been while the quality of both is at its lowest point ever. This is contrary to a collection of data done by the Office of National Drug Control Policy, which states that purity of street drugs has increased, while price has decreased. In contrast to the statistics presented by the DEA, the United States Department of Justice released data in 2003 showing that purity of methamphetamine was on the rise. “Operation Somalia Express” was an 18-month investigation which included the coordinated takedown of a 44-member international narcotics-trafficking organization responsible for smuggling more than 25 tons of khat from the Horn of Africa to the United States. The DEA has a registration system in place which authorizes anyone to manufacture, import, export, and distribute by filing DEA form 225 along with medical professionals, researchers and manufacturers access to “Schedule I” drugs, as well as Schedules 2, 3, 4 and 5. Authorized registrants apply for and, if granted, receive a “DEA number“. An entity that has been issued a DEA number is authorized to manufacture (drug companies), distribute, research, prescribe (doctors, pharmacists, nurse practitioners and physician assistants, etc.) or dispense (pharmacy) a controlled substance. Many problems associated with drug abuse are the result of legitimately-manufactured controlled substances being diverted from their lawful purpose into the illicit drug traffic. Many of the analgesics, depressants and stimulants manufactured for legitimate medical use can often carry potential for dependence or abuse. Therefore, those scheduled substances have been brought under legal control for prevention and population safety. The goal of controls is to ensure that these “controlled substances” are readily available for medical use, while preventing their distribution for illicit distribution and non-medical use. This can be a difficult task, sometimes providing difficulty for legitimate patients and healthcare providers while circumventing illegal trade and consumption of scheduled drugs. Under federal law, all businesses which manufacture or distribute controlled drugs, all health professionals entitled to dispense, administer or prescribe them, and all pharmacies entitled to fill prescriptions must register with the DEA. Registrants must comply with a series of regulatory requirements relating to drug security, records accountability, and adherence to standards. All of these investigations are conducted by Diversion Investigators (DIs). DIs conduct investigations to uncover and investigate suspected sources of diversion and take appropriate civil and administrative actions. Prescription Database Management Programs (PDMP) aid and facilitate investigation and surveillance. In 1985 MDMA and its analogues were under review by the American government as a drug for potential of abuse. During this time, several public hearings on the new drug were held by the DEA. Based on all of the evidence and facts presented at the time, the DEA’s administrative law judge did not see MDMA and its analogues as being of large concern and recommended that they be placed in Schedule III. The DEA administrator, expressing concern for abuse potential, overruled the recommendation and ruled that MDMA be put in Schedule I, the Controlled Substances Act‘s most restrictive category. The DEA is also criticized for focusing on the operations from which it can seize the most money, namely the organized cross-border trafficking of marijuana. Some individuals contemplating the nature of the DEA’s charter advise that, based on danger, the DEA should be most focused on cocaine. Others suggest that, based on opiate popularity, the DEA should focus much more on prescription opiates used recreationally, which critics contend comes first before users switch to heroin. The total budget of the DEA from 1972 to 2014, according to the agency website, was $50.6 billion. The agency had 11,055 employees in 2014. For the year 2014 the average cost per arrest made was $97,325. Others, such as former Republican congressman Ron Paul, the Cato Institute, The Libertarian Party and the Drug Policy Alliance criticize the very existence of the DEA and the War on Drugs as both hostile, and contrary, to the concept of civil liberties by arguing that anybody should be free to put any substance they choose into their own bodies for any reason, particularly when legal drugs such as alcohol, tobacco and prescription drugs are also open to abuse, and that any harm caused by a drug user or addict to the general public is a case of conflicting civil rights. Recurrently, billions of dollars are spent yearly, focusing largely on criminal law and demand reduction campaigns, which has resulted in the imprisonments of thousands of U.S. citizens. Demand for recreational drugs is somewhat static as the market for most illegal drugs has been saturated, forcing the cartels to expand their market to Europe and other areas than the United States. United States federal law registers cannabis as a Schedule I drug. Some groups advocate legalization of certain controlled substances under the premise that doing so may reduce the volume of illicit trafficking and associated crime as well as yield a valuable tax source, although some of the results of drug legalization have raised doubt about some of these beliefs. For example, marijuana is now available as a palliative agent, in Canada, with a medical prescription. Yet 86% of Canadians with HIV/AIDS, eligible for a prescription, continue to obtain marijuana illegally (AIDS Care. 2007 Apr;19(4):500-6.) However, this could be due to the availability or quality of illegal cannabis compared to provisions by government sources. Bureaucratic impediments may also discourage patients from actually attempting to receive it from the government. An April 2012 DEA raid on a California home led to the incarceration of Daniel Chong for several days under conditions of neglect. The 23-year-old student attending the University of California, San Diego was taken into custody along with eight other people when the DEA executed a raid on a suspected MDMA distribution operation at a residence that he was visiting to celebrate the April 20 cannabis “holiday” known as “420“. According to Chong, the DEA agents questioned him and told him that he could go home, one even offering him a ride home, but instead he was transferred to a holding cell and confined for five days without any food or water, although Chong said he ingested a powdery substance that was left for him, which was later found to be methamphetamine. After five days and two suicide attempts, DEA agents found Chong. He was taken to the hospital, where he spent three days in intensive care, because his kidneys were close to failing. No criminal charges were filed against Chong. A DEA spokesperson stated that the extended detention was accidental and the acting special agent in charge of the San Diego DEA office issued an apology to Chong. Chong disputes the claim of accidental neglect, saying that DEA personnel ignored his calls for help. His attorney stated an intent to file a claim against the federal government and some members of California’s delegation to the Congress called for further investigation of the incident. On January 24, 2013, Headley, then 52 years old, was sentenced by U.S. District Judge Harry Leinenweber of the United States District Court for the Northern District of Illinois in Chicago to 35 years in prison for his part in the 2008 Mumbai attacks, in which at least 164 victims (civilians and security personnel) and nine attackers were killed. Among the dead were 28 foreign nationals from 10 countries. One attacker was captured. The bodies of many of the dead hostages showed signs of torture or disfigurement. A number of those killed were notable figures in business, media, and security services. In his 1996 series of articles and subsequent 1999 book, both titled Dark Alliance, journalist Gary Webb asserts that the DEA helped harbor Nicaraguan drug traffickers. Notably, they allowed Oscar Danilo Blandón political asylum in the USA despite knowledge of his cocaine trafficking organization. The government of Bolivia has also taken similar steps to ban the DEA from operating in the country. In September 2008, Bolivia drastically reduced diplomatic ties with the United States, withdrawing its ambassador from the US and expelling the US ambassador from Bolivia. This occurred soon after Bolivian president Evo Morales expelled all DEA agents from the country due to a revolt in the traditional coca-growing Chapare Province. The Bolivian government claimed that it could not protect the agents, and Morales further accused the agency of helping incite the violence, which claimed 30 lives. National agencies were to take over control of drug management. Three years later, Bolivia and the US began to restore full diplomatic ties. However, Morales maintained that the DEA would remain unwelcome in the country, characterising it as an affront to Bolivia’s “dignity and sovereignty”. In the Netherlands, both the Dutch government and the DEA have been criticized for violations of Dutch sovereignty in drug investigations. According to Peter R. de Vries, a Dutch journalist present at the 2005 trial of Henk Orlando Rommy, the DEA has admitted to activities on Dutch soil. Earlier, then Minister of Justice Piet Hein Donner, had denied to the Dutch parliament that he had given permission to the DEA for any such activities, which would have been a requirement by Dutch law in order to allow foreign agents to act within the territory. A 2014 report by the Multidisciplinary Association for Psychedelic Studies and the Drug Policy Alliance accuses the DEA of unfairly blocking the removal of cannabis from Schedule I. The report alleges that the methods employed by the DEA to achieve this include: delaying rescheduling petitions for years, overruling DEA administrative law judges, and systematically impeding scientific research. The DEA continues to refuse the removal of cannabis from Schedule I despite wide-scale acceptance of the substance among the medical community, including 76% of doctors, for the treatment of various disease. The DEA, in addition to enforcement, also regularly engage in advocacy, specifically against rescheduling marijuana, by publishing policy-based papers on certain drugs. Some[who? ]have criticized the DEA for using tax dollars in what they call an attempt to change public opinion, which they call an overreach from the scope of the agency’s job of enforcement, and that by releasing such non-peer-reviewed reports is a transparent attempt to justify its own activities. They have claimed that since the DEA is not, by law, an advocacy group, but a legal enforcement group, that those press releases are tantamount to what they consider domestic propaganda. The DEA has taken a particularly strong stance on enforcement of the Controlled Substances Act on persons and organizations acting within state laws that allow medical cannabis cultivation and distribution. DEA agency executive, Chuck Rosenberg has made negative statements against patients who use medical marijuana. Chuck Rosenberg has mentioned that he considers medical marijuana to be a “joke.” As a reaction against the negative statements made by Chuck Rosenberg towards medical marijuana, an international online petition has been formed. More than 159,737 signatures have been gathered globally with the intention that Chuck Rosenberg will be fired or forced to resign as head of DEA. More recently, the DEA has escalated its enforcement efforts on the recently proliferated Los Angeles area medical cannabis collectives. On July 25, 2007, the DEA raided the California Patients Group, Hollywood Compassionate Collective, and Natural Hybrid (NHI Caregivers) in Hollywood, California. Earlier that day, the operators of those collectives participated in a press conference with LA City Council members announcing the City’s intention to regulate the collectives and asking the DEA to halt raids on collectives while the City drafted regulations. The dispensary operator of Natural Hybrid (NHI Caregivers) was forced to close down the collective due to the tremendous loss caused by the DEA conducted joint task force raid against them. In 2008 the Special Operations part of the agency launched a multi-agency effort named Project Cassandra to investigate the Iranian-backed terrorist group Hezbollah for illicit drug trafficking and terrorist financing. The investigation identified an Iranian cell in the U.S. which worked in concert with a Lebanese bank called the Lebanese Canadian Bank to launder money using the purchase of used automobiles exported to Africa. Project Cassandra also identified hemispheric drug syndicates involved in cocaine trafficking in order to finance Hezbollah terrorism. The Department of Justice issued several sealed indictments, but declined to seize, prosecute, extradite, or further investigate likely targets of these alleged foreign criminal activities operating in the United States due to White House diplomatic objectives involving the international nuclear agreement with Iran. On December 22, 2017, the Attorney General Jeff Sessions ordered a review of prior cases in the project. In 1999, the DEA opened the Drug Enforcement Administration Museum in Arlington, Virginia. The original permanent exhibit – Illegal Drugs in America: A Modern History – remains the museum’s centerpiece. The exhibit features “the more than 150 year history of drugs and drug abuse and the DEA,” including a considerable collection of drug paraphernalia and an image of a smiling drug vendor under the heading “Jimmy’s Joint”. ^ “U. S. DEPARTMENT OF JUSTICE SUMMARY OF BUDGET AUTHORITY BY APPROPRIATION” (PDF). ^ “DEA Leadership”. dea.gov. Archived from the original on June 28, 2018. Retrieved June 11, 2018. ^ “DEA Leadership”. dea.gov. Archived from the original on June 28, 2018. Retrieved March 18, 2018. ^ “Drug Enforcement Administration: Drug Abuse Prevention Service Award” (PDF). Learning for Life. Archived from the original (PDF) on October 20, 2016. Retrieved October 9, 2016. ^ “History of the DEA: 1970 – 1975”. deamuseum.org DEA museum. Archived from the original on September 28, 2007. Retrieved April 30, 2007. ^ “Marijuana Timeline”. Public Broadcasting Service. Retrieved April 23, 2007. ^ “DEA History Book, 1985–1990”. United States Department of Justice. Archived from the original on June 22, 2008. Retrieved August 31, 2011. ^ Michel, Lou; Herbeck, Dan. American Terrorist. ^ Smith, Joseph (2002). “Anti-Terrorism: Criteria, Tools & Technology” (PDF). Protective Glazing. Applied Research Associates, Inc. Archived from the original (PDF) on September 18, 2013. Retrieved October 1, 2014. ^ “The DEA museum | Cannabis Culture Magazine”. Cannabisculture.com. December 15, 2009. Archived from the original on January 19, 2012. Retrieved August 31, 2011. ^ “1999–2003”. DEA. Archived from the original on May 26, 2007. Retrieved June 3, 2007. ^ “Title 28, C.F.R., Part 0.102” (PDF). Department of Justice. p. 57. Archived from the original (PDF) on August 10, 2007. Retrieved April 28, 2007. ^ “DEA Office Locations”. Drug Enforcement Administration. Archived from the original on July 22, 2008. Retrieved July 9, 2008. ^ “Top Careers for Students of Criminology and Criminal Justice”. Portland State University. Retrieved 30 September 2014. ^ “Drug Questionnaire”. U.S. Drug Enforcement Administration. Archived from the original on May 13, 2007. Retrieved April 28, 2007. ^ “FBI may relax hiring policy on drug use”. MSNBC. October 9, 2005. Retrieved August 31, 2011. ^ “Inside the DEA > DEA Programs > Aviation”. U.S. Drug Enforcement Administration. Archived from the original on September 20, 2008. Retrieved September 13, 2008. ^ John Shiffman (August 5, 2013). “How DEA program differs from recent NSA revelations”. Reuters. Retrieved August 5, 2013. ^ “DEA / Cannabis Eradication”. www.dea.gov. Retrieved 2017-06-07. ^ “DEA / Cannabis Eradication”. www.dea.gov. Retrieved 2017-06-08. ^ “Analysis | The DEA spent $73,000 to eradicate marijuana plants in Utah. It didn’t find any”. Washington Post. Retrieved 2017-06-07. ^ “U.S. Department of Justice Drug Enforcement Administration – FY 2016 Performance Budget Congressional Submission” (PDF). www.justice.gov. ^ “Congress Wants the DEA to Prove Marijuana Eradication Program Is Necessary”. Congressman Ted Lieu. 2016-10-28. Retrieved 2017-06-07. ^ “Drug Enforcement Administration Highlights Year’s Accomplishments”. dea.gov. December 28, 2005. Archived from the original on June 27, 2006. Retrieved April 28, 2007. ^ “What America’s Users Spend on Illegal Drugs 1988–1998”. Office of National Drug Control Policy. December 2000. Archived from the original on 2007-03-12. Retrieved 2007-04-28. ^ “News from DEA, News Releases, 12/11/08”. Usdoj.gov. Archived from the original on August 21, 2009. Retrieved August 31, 2011. ^ Figure 4 Source: ONDCP. 1998 National Drug Control Strategy. Table 20. ^ Figure 5 Source: ONDCP. 1998 National Drug Control Strategy. Table 20. ^ Robinson, Matthew B.; Scherlen, Renee G. (2010-03-10). Lies, Damn Lies and Drug War Statistics. ISBN 9780791480670. Retrieved 2011-08-31. ^ “24 MDMA, Chorles S. Grob and Russell E Polond”. Drugtext.org. Archived from the original on September 11, 2011. Retrieved August 31, 2011. ^ “DEA Staffing & Budget”. Justice.gov. Archived from the original on January 3, 2015. Retrieved December 18, 2014. ^ Boaz, David; Timothy Lynch (August 12, 2004). “The war on drugs” (PDF). Cato Handbook on Policy. Cato Institute. pp. 253–260. Archived from the original (PDF) on April 15, 2007. Retrieved May 3, 2007. ^ Libertarian Party. “LIBERTARIAN PARTY PLATFORM”. ^ Drug Policy Alliance. “Mission and Vision”. Retrieved May 3, 2007. ^ “News from DEA, News Releases, 02/10/99”. Usdoj.gov. Archived from the original on October 21, 2008. Retrieved August 31, 2011. ^ “DEA, Drug Scheduling”. Usdoj.gov. Archived from the original on October 20, 2008. Retrieved August 31, 2011. ^ Huus, ‘Kari. “Student’s ordeal: How was Daniel Chong lost in DEA detention?”. MSNBC. Archived from the original on July 11, 2012. ^ a b c Grieco, Sarah. “DEA Ignored all my Cries: Student”. NBC San Diego. ^ a b Lovett, Ian (May 2, 2012). “California Man’s ‘Drug Holiday’ Becomes Four-Day Nightmare in Holding Cell”. The New York Times. ^ a b c d Carter, Terry (12 August 2013). “Sweeping reversal of the War on Drugs announced by Atty General Holder”. ABA’s 560-member policy making House of Delegates. American Bar Association. p. 1. Retrieved 16 August 2013. ^ a b c d “Smart on Crime: Reforming The Criminal Justice System” (PDF). Remarks to American Bar Association’s Annual Convention in San Francisco, CA. US Department of Justice. August 12, 2013. p. 7. Retrieved 16 August 2013. ^ “HM announces measures to enhance security” (Press release). Press Information Bureau (Government of India). 11 December 2008. Retrieved 14 December 2008. ^ a b Stevens, Andrew; Kapur, Mallika; Shah Singh, Harmeet; Ahmed, Saeed; Sidner, Sara; Vinci, Alessio; Sayah, Reza; Newton, Paula (29 November 2008). “Indian official: Terrorists wanted to kill 5,000”. CNN. Archived from the original on 2 December 2008. Retrieved 30 November 2008. ^ “Indian forces storm Jewish centre”. BBC News. 27 November 2008. Archived from the original on 28 November 2008. Retrieved 27 November 2008. ^ P.S. Suryanarayana (27 November 2008). “Caught in the crossfire, 9 foreign nationals killed”. The Hindu. Chennai, India. Retrieved 27 November 2008. ^ Krishnakumar P; Vicky Nanjappa (30 November 2008). “Rediff: Doctors shocked at hostages’s torture”. Rediff.com. Archived from the original on 5 March 2009. Retrieved 21 February 2009. ^ Naughton, Philippe (27 November 2008). “British yachting tycoon Andreas Liveras killed in Bombay terror attacks”. The Times. UK. Retrieved 27 November 2008. ^ “Three top cops die on duty”. The Times of India. India. 27 November 2008. Retrieved 27 November 2008. ^ “Indian victims include financier, journalist, actor’s sister, police”. CNN. 30 November 2008. Archived from the original on 2 December 2008. Retrieved 30 November 2008. ^ Christopher Toothaker. “Venezuela rejects U.S. drug report, accuses DEA of collaborating with traffickers”. New County Times. Retrieved March 2, 2007. ^ Webb, Gary (1999). Dark Alliance. Seven Stories Press. p. 177. ISBN 978-1-888363-93-7. ^ “Morales: Government will take over for DEA in Bolivia”. CNN. November 1, 2008. Archived from the original on October 5, 2012. Retrieved November 2, 2012. ^ “Bolivia’s Morales insists no return for US drug agency”. BBC. November 8, 2011. Retrieved November 2, 2012. ^ de Vries, Peter R. (October 2, 2005). “Dossier: De zwarte Cobra”. Programma (in Dutch). Archived from the original on September 27, 2007. Retrieved May 12, 2007. ^ Shiffman, John; Cooke, Kristina (Aug 5, 2013). “Exclusive: U.S. directs agents to cover up program used to investigate Americans”. Reuters. Retrieved Jun 2, 2016. ^ O’Hehir, Andrew (August 10, 2013). “The NSA-DEA police state tango”. Salon. Retrieved June 2, 2016. ^ “The DEA: Four Decades of Impeding And Rejecting Science”. DPA, MAPS. Retrieved 14 June 2014. ^ Grotenhermen, F; Müller-Vahl, K (Jul 2012). “The therapeutic potential of cannabis and cannabinoids”. Deutsches Arzteblatt International. 109 (29–30): 495–501. doi:10.3238/arztebl.2012.0495. PMC 3442177. PMID 23008748. ^ Pamplona, FA; Takahashi, RN (Jan 2012). “Psychopharmacology of the endocannabinoids: far beyond anandamide”. Journal of Psychopharmacology (Oxford, England). 26 (1): 7–22. doi:10.1177/0269881111405357. PMID 21652605. ^ Adler, Jonathan N.; Colbert, James A. (30 May 2013). “Medicinal Use of Marijuana — Polling Results”. New England Journal of Medicine. 368 (22): e30. doi:10.1056/NEJMclde1305159. PMID 23718175. ^ “Feds Raid 11 Medical Marijuana Clinics, DEA Does Not Recognize California Law legalizing medical use of pot”. CBS News. Retrieved August 31, 2011. ^ Rough, Lisa (November 18, 2015). “Petition to Fire DEA Chief Gains Traction”. Leafly. Retrieved June 12, 2017. ^ “Feature: Move to Block DEA Medical Marijuana Raids Heads for House Floor Vote Next Week”. Stopthedrugwar.org. Retrieved August 31, 2011. ^ “Santa Cruz officials fume over medical pot club bust / DEA arrests founders, confiscates plants”. San Francisco Chronicle. September 6, 2002. Retrieved August 31, 2011. ^ “Federal Court Rules U.S. Government May Not Deliberately Subvert California’s Medical Marijuana Laws”. American Civil Liberties Union. August 20, 2008. Retrieved August 31, 2011. ^ Lee, Martin (2012). “An Industry Emerges: The Rise of Medical Marijuana”. Reality Sandwich. Retrieved 1 October 2014. ^ Meyer, Josh. (18 December 2017). “The secret backstory of how Obama let Hezbollah off the hook”. Politico website Retrieved 24 December 2017. ^ Hacohen, Hagay and Wilner, Michael. (23 December 2017). “Sessions Orders a Review of Project Cassandra”. Jerusalem Post website Retrieved 25 December 2017. ^ “Illegal Drugs in America, a Modern History”. DEA Museum Website. Archived from the original on October 24, 2011. Retrieved February 27, 2012. Harry J. Anslinger and Will Oursler (1961), The Murderers: The Story of the Narcotic Gangs, New York: Farrar, Straus and Cudahy. Edward Jay Epstein (1977), Agency of Fear: Opiates and Political Power in America, New York: Putnam. Wayne Smith (2012), Waffle House Diaries, Chattanooga, TN: Bluehotel Press. “98 Percent of All Domestically Eradicated Marijuana Is ‘Ditchweed,’ DEA Admits”. NORML. September 7, 2006. Retrieved March 27, 2007.